Two cousins have created a head-up navigation application called HUDWAY. The application, which can be downloaded to smartphones, projects the road ahead onto the windshield, improving road safety when visibility is poor. The application, called HUDWAY, was launched in Russia in August 2013, with its international version following two months later. It is already available in English, German, Polish, and Chinese. The co-founder and CEO of the project is Ivan Klabukov, who is developing the startup together with his cousin, who three years ago became interested in professional car rallies. "Can you imagine: You are driving at night, through a forest, along a winding narrow road, at a speed of 100-150 kilometers per hour. One mistake, and you are off the road and the car is badly damaged, and repairs are very expensive. So there was demand for a more reliable navigator," Klabukov told RBTH. It was after hearing his cousin's rally stories that he came up with the idea of HUDWAY. 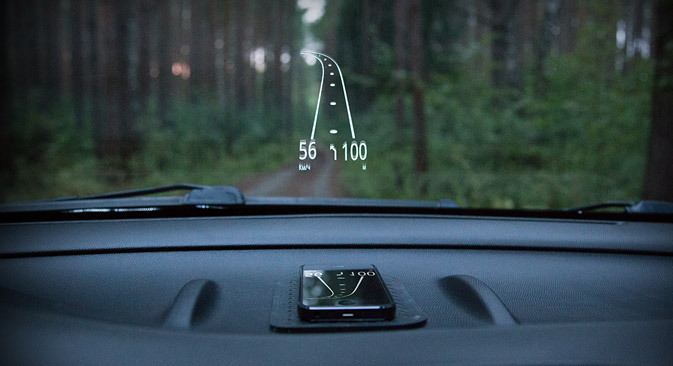 In the end, the idea was implemented in the form of a mobile application that projects the car's route, in 3D format, onto the windshield. The driver sees all the curves and differences in surface level of the road and, importantly, not just the next turn but the one after it as well, which makes the driver better prepared and boosts their confidence. If a human navigator tells the driver what is round the corner, HUDWAY shows it – although it can "talk" too. Fully aware that in several years' time, all cars will be sold with systems similar to HUDWAY automatically built into them, the project team are not at all daunted. "In five years' time, far from all vehicles will be fitted with systems like this, only those in the premium segment. Which is good,” says Ivan Klabukov. “Owners of other cars, not having this function, will be curious to try for themselves what this thing is. And we shall give them an opportunity to do just that. That is to say, it will only warm the market up." Experts are equally optimistic about the prospects of the project. "The idea is not new but is interesting. So it will most likely be in demand. I have tried other projection applications, like a speedometer, it was fun," says Alexei Shevelev, project manager at the Thematic Media company. "Any idea or device that improves road safety has the right to exist and to enjoy interest from motorists," says Alexei Starodymov, an independent gadget market expert and editor of mobile and digital tech website DGL.ru.